Most agents will discuss the 3 P's of marketing, but here at the Lally Team we have seven P's in our highly-refined marketing plan. Most other Realtor's three P's consist of this: 1) Put a sign up 2) Put it in the MLS 3) Pray that the property sells. While there is nothing wrong with this system, we prefer to do a bit more for our home sellers. 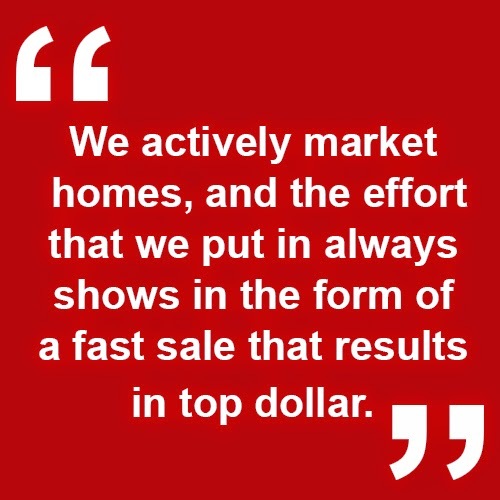 We actively market homes, and the effort that we put in always shows in the form of a fast sale that results in top dollar. Here at the Lally team we use seven P's to promote your home to the best buyers in order to fetch the highest dollar for your property, all within the shortest amount of time possible. Price: This is the most important reason why a home will or will not sell. We do extensive market analyses to price your home at break points that leverage your home against your competition to drive up your sale price. Product: In this case, the product is your home. We provide a detailed to-do list so that you can make your home as perfect as possible before listing. Contact us and we'd be glad to share some secrets on what buyers like to see in homes, and how you can fine-tune yours to fetch the highest price possible. Promotion: We spend over $16,000 a month on marketing, so your home reaches the widest audience possible to attract the most qualified buyers. We also have a radio show on Saturdays, 11AM-12PM on KHVH 830 and KIKI 990 that we can use to promote your home across the state. However, these are only a few of the ways we can market your home. If you want to hear about the last four P's in our marketing strategy (Positioning, Process, People, Physical evidence) , please visit our website or contact us! We would love to help market your home to a wide audience to get you top dollar. If you'd like more information about the Maui and Honolulu real estate guidebooks mentioned in this video, CLICK HERE!